GREECE AND SPAIN ARE BOTH MEDITERRANEAN COUNTRIES WITH GREAT HOLIDAY ISLANDS. BUT WHICH ISLAND WINS THE TITLE AS THE BEST PARTY ISLAND – IBIZA OR MYKONOS? Ibiza is a worthycontender. This 570-km Spanish island is famous for its “chill-out” compilations and clubbing. It’s one of the Balearic Islands located in the Mediterranean Sea. Although Ibiza may be the epicentre of the electronic music scene, this party island has a lot more to offer than just techno-blaring clubs. There has been a massive development in the island’s “hippie-district” where bohemian people gather for concerts, bars and music reminiscent of the 1970s. The latest issue of Hot English (180 – the May issue) is out now! Learn over 300 useful words and expressions and improve your listening skills with Learn Hot English! 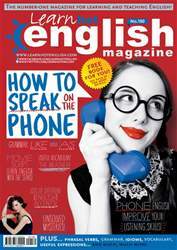 This month: How to speak on the phone! Learn how to use your tone of voice to speak more effectively, and also how to work out what other people are saying or feeling. This will help you at work and with your personal life, as well as improving your ability to speak and listen over the phone in English. Plus, 12 useful “travel” words, 10 useful past tense verbs, 8 words and expressions for describing the weather, 10 words for talking about fast food, useful expressions for describing power, “knife” idioms, “work” phrasal verbs... plus: Grammar – confusing travel words. Language – “like” versus “as”. Film – a clip from the Simpsons movie. Competition! – win a free book! Travel – islands to visit. Psychology – colour and personality. Phone – how to rent a car over the phone. Drinks – learn how to make a “Nojito”. Mystery – 6 unsolved mysteries. History – the story of Gibraltar. TV – the TV series Lost! Business – how to save a failing pub! Slang – learn some useful slang terms! Work – bullying at work. Useful phrases – expressions with numbers! AND LOTS, LOTS MORE! By reading and listening to all this great content, you'll improve your English reading and listening skills and learn up to 300 useful words or expressions. Plus, you'll get a better job and pass English-language exams more easily. Guaranteed! HOW TO SOUND GOOD ON THE PHONE! How to save a pub!